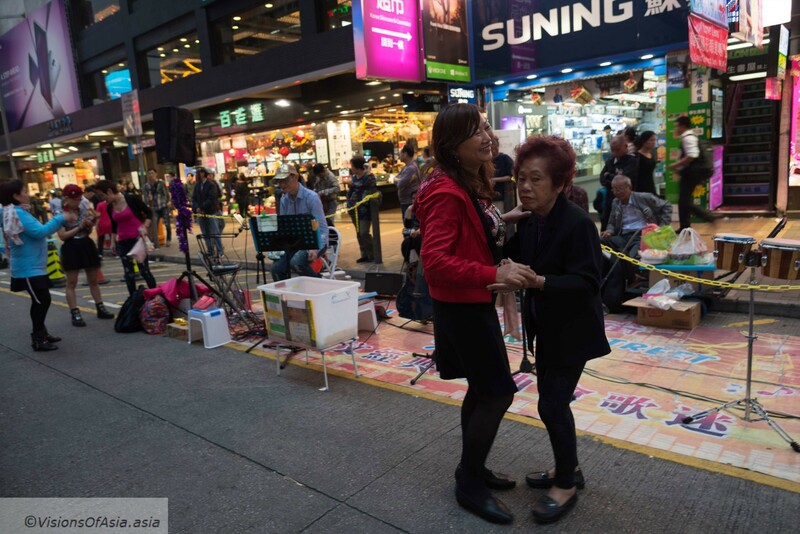 Sunday night was the last occasion on which Sai Yeung Choi South street was open to pedestrians. At 22hrs, the police invited performers and crowds to leave. On this last hooray, a huge crowd had come to bid farewell to karaoke street. 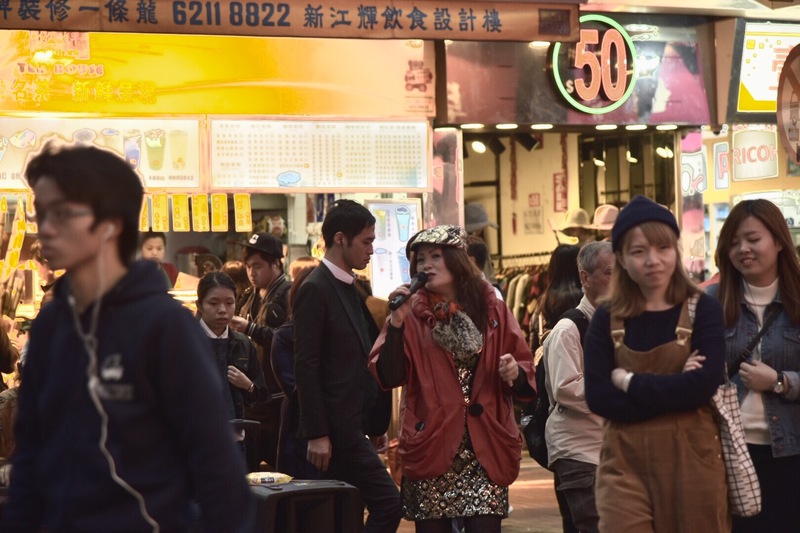 The end of “karaoke street” is not totally unexpected as performers had kept on increasing their professional-level sound systems to drown competition under the decibels, leading to regular complaints by local businesses.For some performers, it was the occasion of making some nice money. A singer performs on Sai Yeung Choi South street receiving banknotes as thanks for her performance. 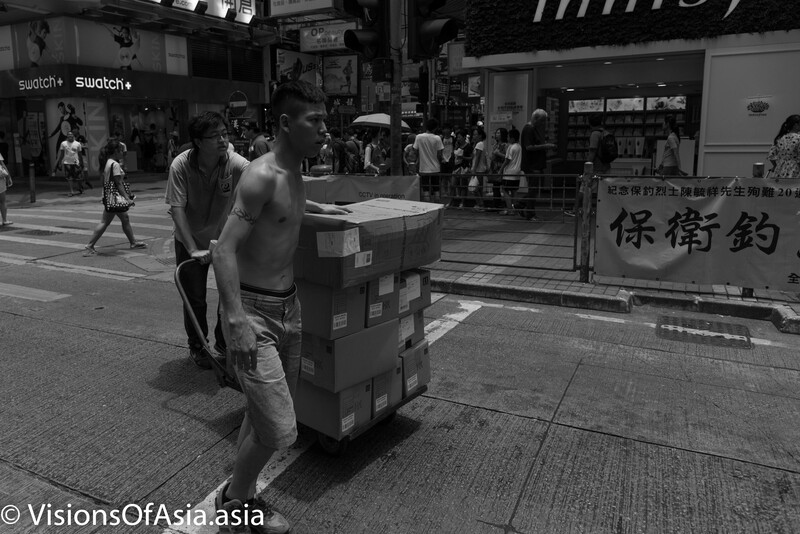 Despite these inconveniences, the whole street exuded a formidable vibe that best embodied the spirit of Mongkok, and its grittiness. 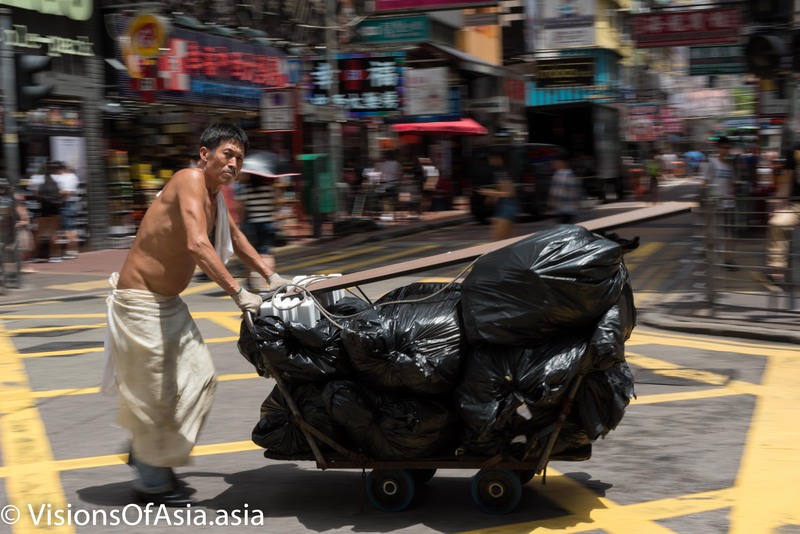 Hong Kong may have become more orderly today, but it certainly lost a part of its soul. Some performers, when faced with some technical issues already left on Saturday: “I do this because I like it, not for money”, said a man with a big portable sound system. “Clapping is enough for me”. At the same time, many other performers were much less generous with their time, receiving a lot of envelops ladden with cash on their last days. 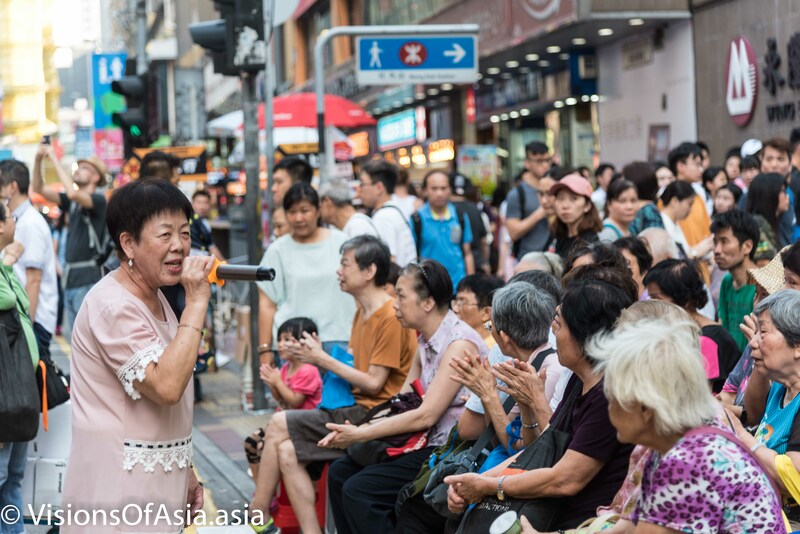 Despite the greed (which was ultimately the downfall), Karaoke street also provided entertainment for older HongKongese lacking places of commonality in the city. Some of the performances could often derive in full blown dances by dozens of people. This video I took last time is a perfect illustration. 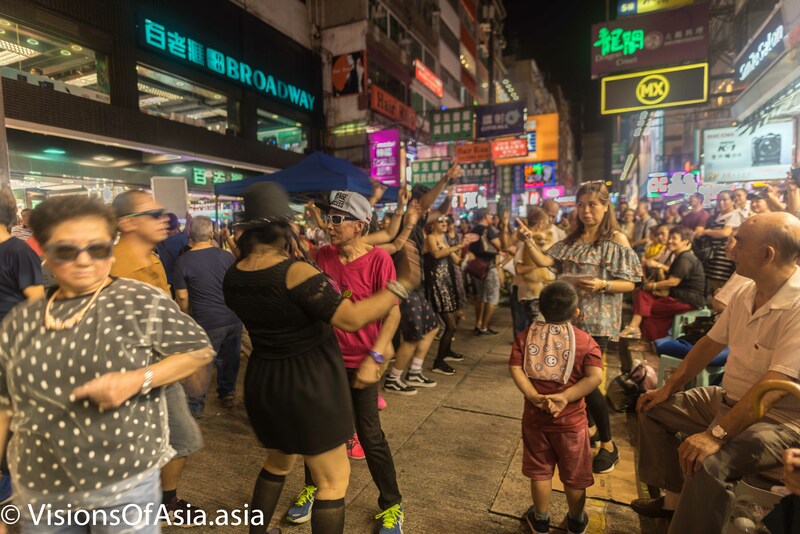 It must be said that Mongkok is not an easy place to police and keep happy, as they were the theater of the”fishball riots” in 2015, in the aftermath of the umbrella movement. It is possible that political and policing afterthoughts were not very far from the mind of the district council which asked for the removal of Karaoke street. Most performers took it in stride, vowing to find another place to perform. However, Hong Kong will soon realize it lost a part of its soul, killing an entertainment that was famous with tourists worldwide. Where the farewell to karaoke street may have been bittersweet, another piece of vibrant culture has disappeared. The death of “Karaoke Street”? 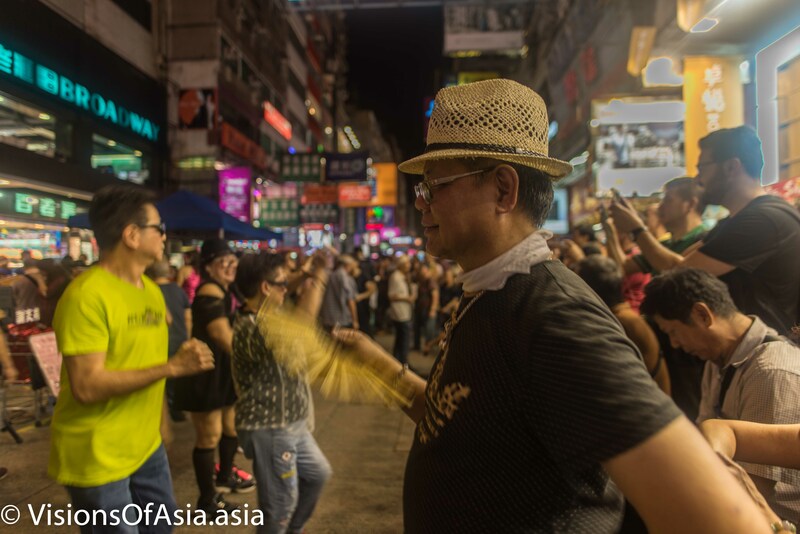 June 4, 2018 VoAadmin Culture, Editorial, Hong Kong, News, Night photography, Photography, Street photographyTagged cantopop, Hong Kong, karaoke, Karaoke street, Mongkok, sai yeung choi street south, street performersLeave a Comment on The death of “Karaoke Street”? It was announced and it finally came: it seems all but certain now that the Sai Yeung Choi south street in Mongkok will be closed to entertainers. In fact, in a previous post, we mentioned that the decibels were causing a lot of complaints. 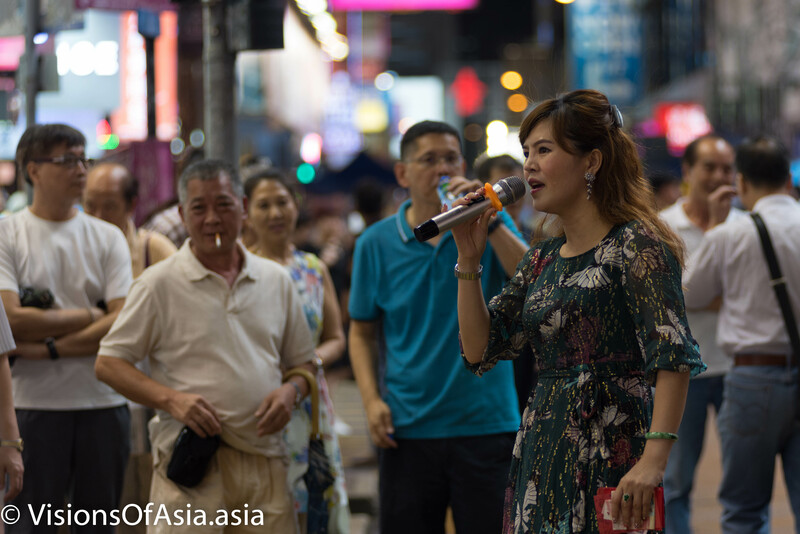 In a recent vote, the District Council of Yau Tsim Tong passed a motion to close the pedestrian area of the famous Mongkok “Karaoke Street”. In fact, complaints about the noise and disturbance in “Karaoke street” are not new. Local businesses have been complaining about the impossibility of carrying out business with increasingly louder karaoke installations. The complaints reached a new threshold as the performers kept bringing out louder speakers and more professional material, such as TV’s, generators and mixing tables. The “professionalization” of the peforrmers and their competition meant that you had people placed at just ten meters of each other, competing to be heard by passersbys witih increasingly louder volumes of sound. Despite this, the vibe of “Karaoke street” was absolutely contagious, as can be reflected in this video and several periscopes I made at the same place over the years. Sai Yeung Choi South street in Mongkok, is known as a hotbed of local popular culture, but also the last refuge of localists. In fact, among the performers, the last remnants of the “Umbrella Movement” found a refuge on that street. The famous Mongkok riots of 2015 also took place in that area. 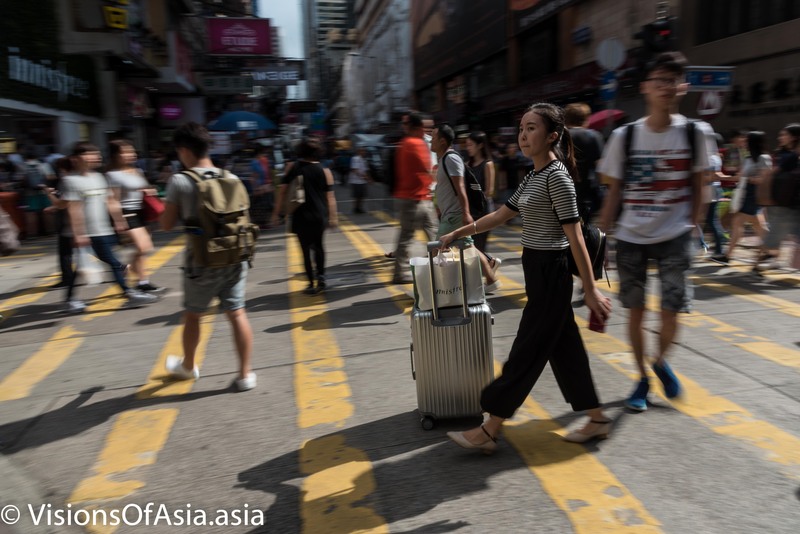 As of today, the area has become one of the last places to observe the typical Hong Kong culture and mostly older residents who enjoy their free time on week-ends. 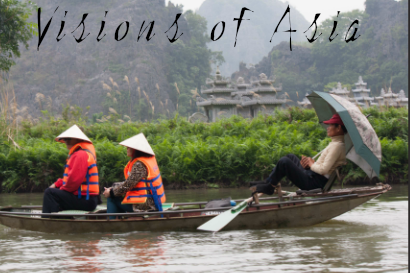 Suppressing this area might thus trigger other political consequences. That is probably the reason why the HK government was not in a great hurry to offer a timetable for the eviction of the pedestrian zone. In fact, the district council has no power to edict legislation, and it can only offer recommendations to the HK government. The said government promised it would act “as soon as possible” on the recommendations. Nevertheless, the conflict of interests and the complaints of local businesses have given rise to an interesting situation in Hong Kong. How to reconcile the desire for entertainment and the needs of local businesses? As always, the solution might be in the middle. Why not enforce a tougher regulation of sound levels among performers? Why not continue allowing this lovely entertainment area and participate in giving this extra vibe to Hong Kong? Performers must be reined in, but it is certain that if Sai Yeung Choi South is closed as a pedestrian area, a lot less people will be circulating there. Some editorials have tried suggesting such a compromise, but given how high tensions can rise in that area, it is not sure what approach the HK government will retain, but more than ever, Mongkok promises to be a tricky area to administer. So, as long as they are still there, I will keep documenting the performers of Sai Yeung Choi South… Hoping to see them still for a long time. 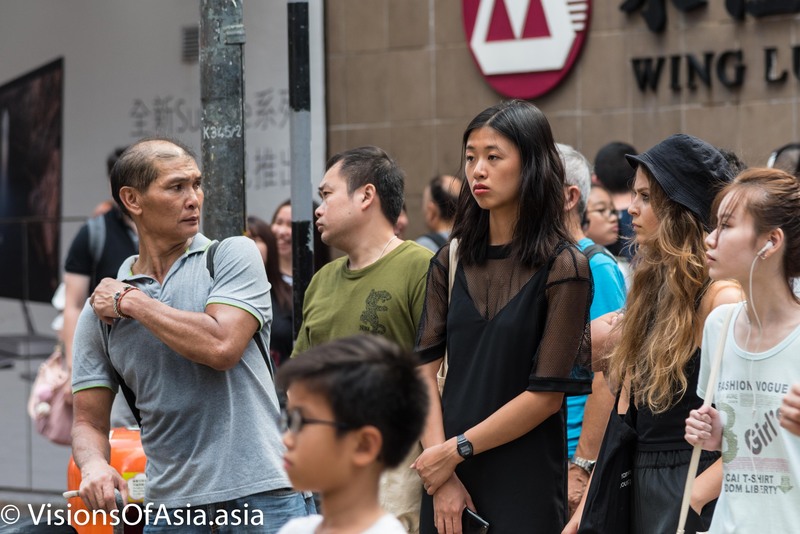 To understand better this area, it should be known that Mongkok’s Sai Yeung Choi street featured prominently among the Mongkok Umbrella movement hot spots as well as during the infamous “fishball riots“. Today, while the calm has returned, it still is a very populous area. Young and older Hongkongese come to enjoy the karaoke and the atmosphere on week-ends and public holidays. Not to mention, it is the only place where the last few remnants of the Umbrella movement still hold a sit-in. The problem is that most karaoke performers come there to earn money. When money is involved, it is the guarantee things will run out of hand. And indeed, performers have started competing by raising the sound level of their installation. Originally, that karaoke street was taking place every evening. As people complained of the sound pollution, they restricted it to week-ends and public holidays. If the sound pollution continues being a nuisance, it is highly possible this original cultural spot will be eliminated altogether. For now, you may want to go and check it out yourself (Mongkok MTR, exit “D), look for “Sai Yeung Choi South Street”. Some times, to progress in photography, it is good to oblige yourself to do an exercise in style. 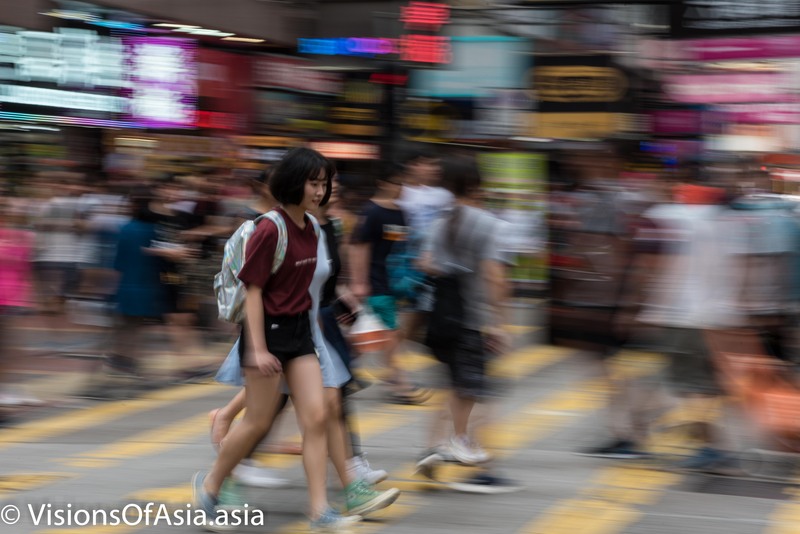 Today, my photography exercise was taking panning shots in a street of Mongkok. Panning shots involve staying put in one position and (ideally) shooting subjects which are passing parallel to your position. Using a low shutter speed (1/30th to 1/25th), you manage to get a motion blur which, when well done, detaches the subject from the background. Where it gets difficult is that to get a perfect picture, you should have the maximum details on the subject. For that to happen, the speed at which you are moving the camera should be synchronized to your subject. Difficult to do that when the shutter closes, right? That’s why, you must look beyond the viewfinder, above your camera, to make sure you are synchronizing the camera to your subject. A special case of panning shots can be done at night, but preferably with bikes. This shot was taken in Thailand. 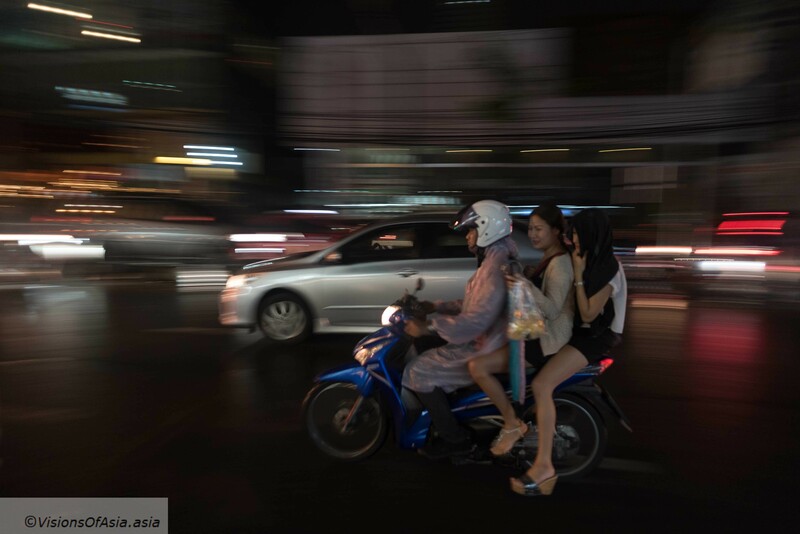 Two girls on a motosai in Bangkok, Thailand. As this was shot at night, after the rain, it provided interesting reflections on the floor increasing the panning effect. 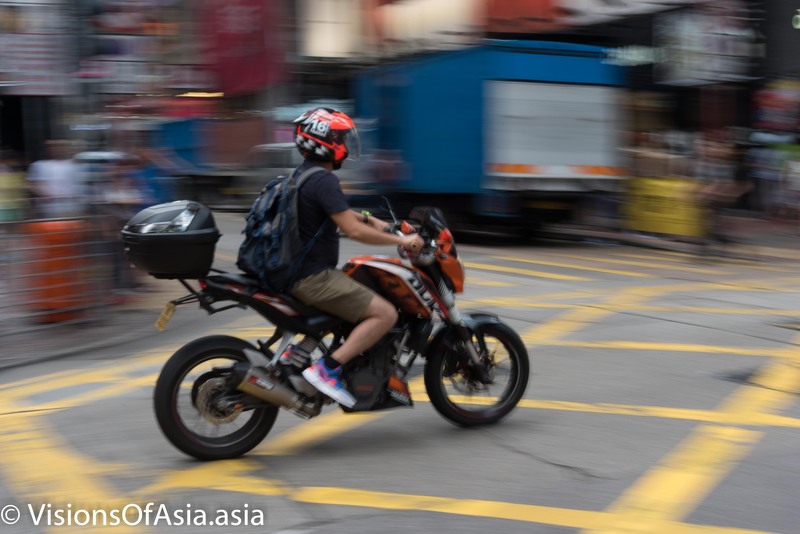 While in Bangkok, there are a lot of bikers, hence allowing to use panning shots, Hong Kong has a bit less of these, but still, some occasion may arise as seen below. Bikes generally have a fixed speed, so theoretically easier to shoot, but not always easy to align your speed on the bike! The conclusion is to go out and take one morning obliging yourself only to shoot panning shots. Experience is vital, as even after a while, you may still have a lot of missed shots. Black and white photography can be an interesting way of focusing the attention of the viewer on the most important elements of a scene. This post is thus more of a stylistic exercise. Here, you have an illustration on how B&W photos dim distractions that might crowd a picture when shot in color. The background of these photos are all filled with a number of colorful displays, lights and shops. Black and White puts the focus on the subjects at the heart of these pictures and allows to “erase” the distraction. 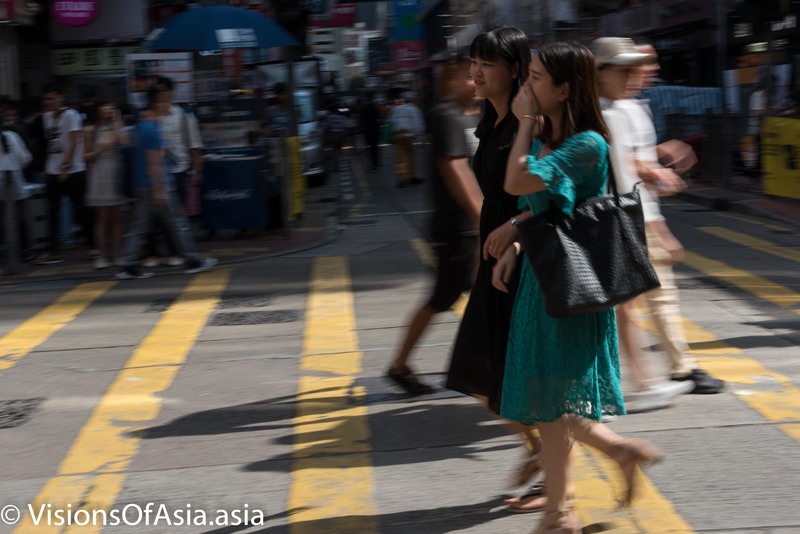 Actually, the areas around Mongkok are filled with street photography opportunities, as they are heavy circulation areas. In addition, there is still a lot of traditional activities going on (cart pushers, cardboard ladies, pretty girls going out…). So, if ever you are feeling like trying your hand at street photography, just go and take a stroll in that area. I love going there on week-ends at night, but it will be the subject of another post. 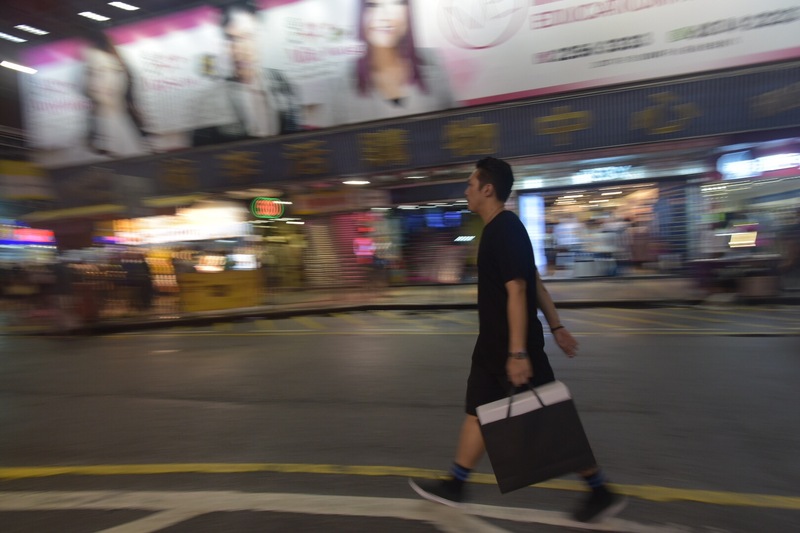 At night, in Mongkok’s walking street, a man walks past as shops are closing.